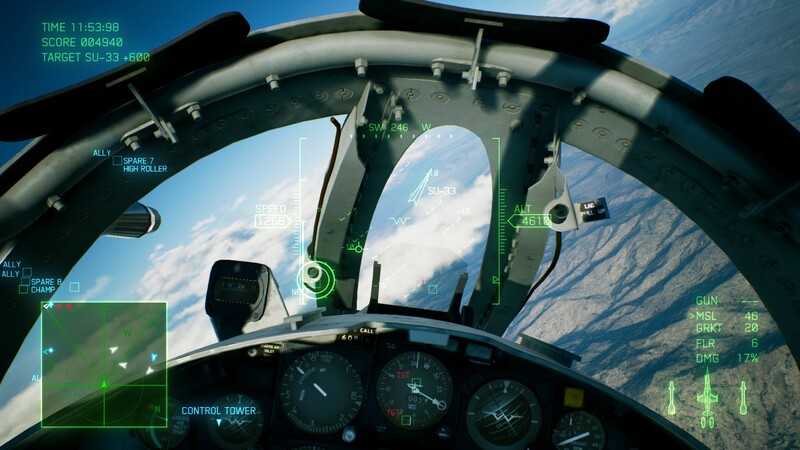 There’s something refreshingly straightforward about Ace Combat 7. 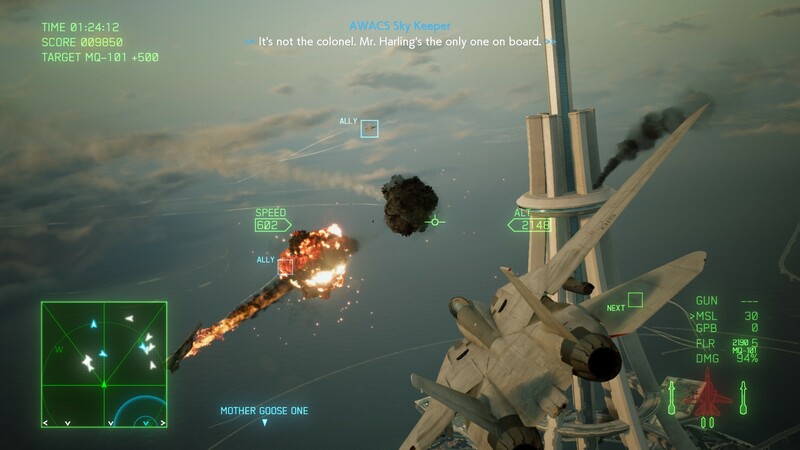 At a time when almost every AAA game needs to be a an open, shared, hybrid single and multiplayer world that’s competitive but also team-based with persistently evolving gameplay, a compelling endgame and a drone that serves you drinks while you play, Ace Combat 7 is about Flying a Cool Plane and Blowing Stuff Up. That’s it. 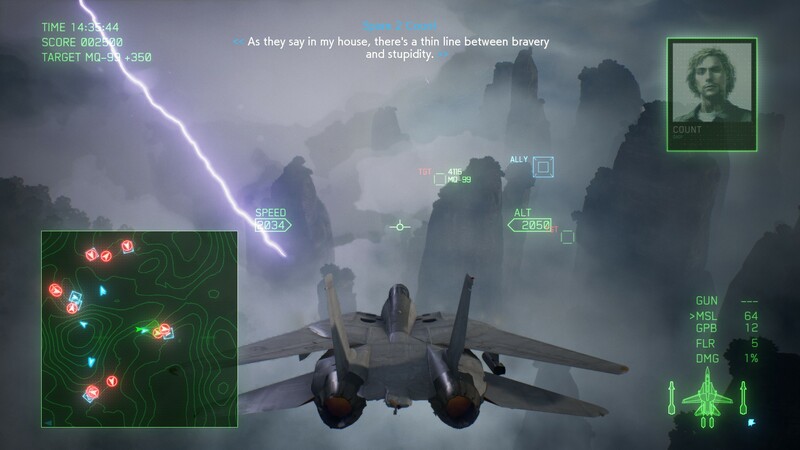 In fact, Ace Combat 7 is so overwhelmingly concerned with these two things that it often deliberately sidelines other seemingly logical plane-related activities because they are not exciting enough. Here’s how I imagine the conversation between the developers went when making these decisions. Dev 1: You know this whole “taking off” thing? Dev 2: What of it? Dev 1: Well, it’s a bit boring, isn’t it? Dev 2: It’s a pretty fundamental element of Flying a Cool Plane. Dev 1: Yeah, but, it doesn’t involve any Blowing Stuff Up does it? Dev 1: So why don’t we just let the player skip this bit and start the mission in the middle of the Blowing Stuff Up? Dev 2: In the sky? Dev 1: Yeah, while Flying a Cool Plane. Dev 2: Sure. Alright, let’s do that. Dev 1: You know this whole “landing” thing…? I have enormous respect for any modern game that focusses on doing one thing well, and Ace Combat 7 is absolutely that… mostly. 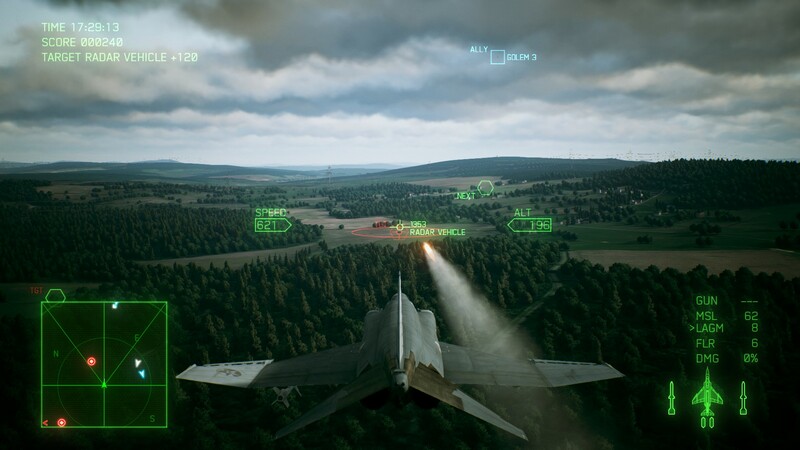 It says a lot about Ace Combat 7 that the one area where it doesn’t focus on Flying a Cool Plane and Blowing Stuff Up is also the one area where it’s a bit rubbish. That area is (and I’m sure this will shock you) storytelling! The main problem is there is so much of it. The cutscenes are so interminable that sometimes it feels more like you’re watching a film that features cut-missions. Worse, most of this centres around a character who barely even features in the game itself. You could remove every cutscene that doesn’t concern itself with mission planning, and you’d probably not notice. All the story you need features in the missions themselves and the mission prep. The 20-mission campaign sees you playing as Trigger, a hotshot pilot for the Army of Osea, which is at war with the neighbouring country Erusea. Early on in the story, you are convicted of what I shall simply describe as A Big Crime, and you are sent to – and I am not kidding – Pilot Prison. This is exactly like regular prison except for the fact that you still get to Fly a Cool Plane and Blow Stuff Up before returning to prison to serve your sentence like any convict equipped with an incredibly fast plane absolutely would do. 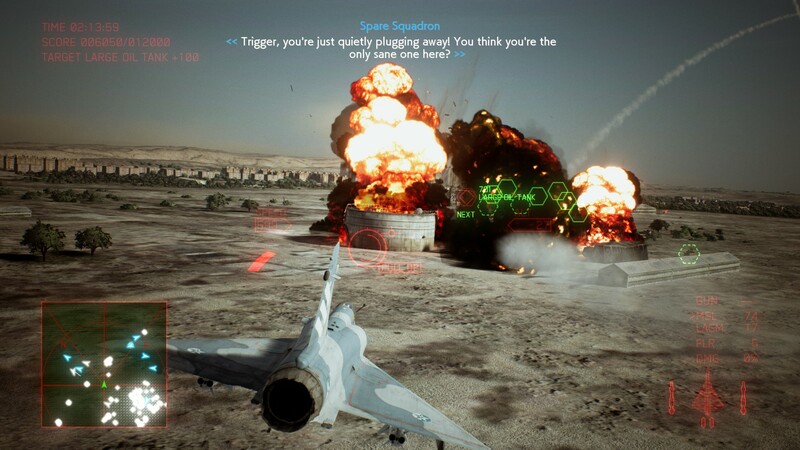 Obviously, this is utterly daft, but it's precisely such absurd scenarios that make Ace Combat 7’s campaign such fun to play. 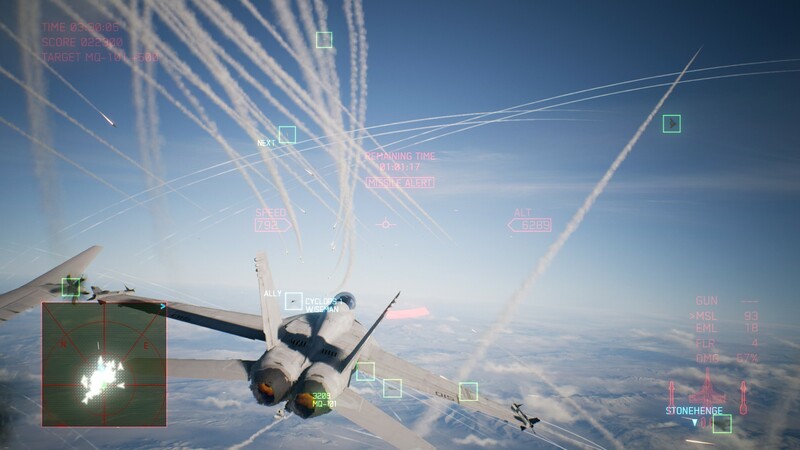 Rather than frame itself in a realistic setting, Ace Combat 7 proposes a near-future scenario, which gives it license to be far more creative with mission parameters. Highlights include a daring rescue of the Osean President from a Space Elevator and an assault on a giant plane called the Arsenal Bird which acts an airborne carrier for hundreds of jet-sized drones. There are missions that takes place during dust storms and thunderstorms, and others where you need to fly under the radar or below the clouds to remain undetected by enemy artillery. It’s structured in such a way that you’re always keen to see what the game will throw at you next. Even in the more pedestrian missions, the game is still fun thanks to its slick and exhilarating combat. 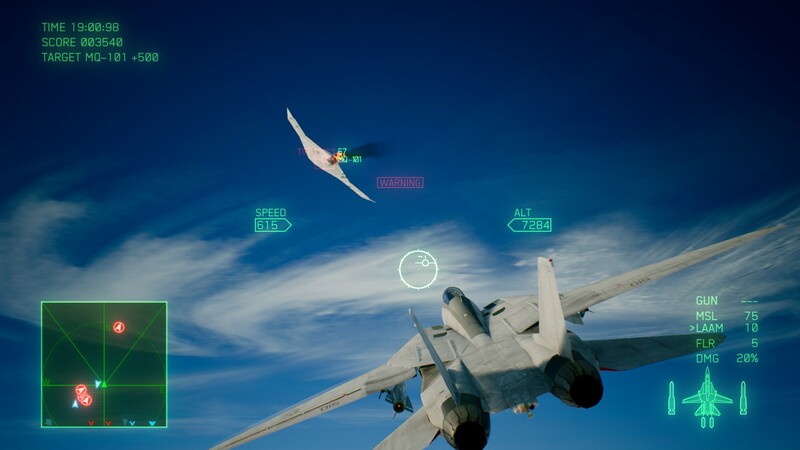 Ace Combat 7 offers two control schemes, one of which is mildly simulationist while the other lets you mostly forget about annoying things like physics and throw your aircraft around as if it was held by a toddler. I’ve played perhaps an hour’s worth of flight-sims in my entire life and was pulling off daring low-altitude strafing runs by the third or fourth mission. Most missions involve a mixture of air-to-air and air-to-ground combat, often generating tension by stretching your mission objectives between the two, forcing you to attack and/or defend on multiple fronts at once. All jets are equipped with a central minigun and a substantial payload of guided missiles, plus a third “special weapon” that can be anything from straightforward bombs or cluster-missiles to more exotic fare like railguns and even lasers. There’s a light tactical element in choosing the best equipment for a mission. If you’re going to be blowing up ships, for example, it’s probably a good idea to take the Ship-Blowing-Up Missiles (as I believe they are officially known). Enemies are surprisingly diverse in the air too. You’ll probably struggle to tell the difference between pilot-controlled jets. But drones are extremely difficult to keep in your sights, as they’re able to withstand g-forces human pilots cannot. Helicopters, meanwhile, are easy to shoot down, but will constantly needle you with missiles if ignored. Whatever you’re blowing up, however, it’s always satisfying to watch your target burst in a cloud of fire and black smoke. My main issue with Ace Combat is the tedious storytelling, but there are a couple of smaller problems too. Some of the mission failure states can be annoyingly vague, and as the game uses checkpoints saves it’s quite possible to lose large chunks of progress because you weren’t quick enough to respond to an evolving situation the game only mentioned over radio chatter. Also, this isn’t really a flaw, but you definitely need a gamepad or a joystick to get the most out of it. Playing Ace Combat 7 with a keyboard is theoretically possible, but so is playing a trumpet with your nose; I wouldn’t recommend it. I would, however, recommend Ace Combat 7. It’s a straightforward, accessible game about Flying a Cool Plane and Blowing Stuff Up, and the way it approaches this through its near-future setting makes it a little bit different from your usual flight-sim affair. It’s completely silly, of course, but it’s also rather delightful.